When your week starts off with an ambulance ride, a broken tooth, and stitches, you know it's not good. Last week a after nursing the two kids through a stomach virus, I succumbed to it. It hit me like a ton of bricks in the middle of the night. I felt awful. My husband woke up at 6am on Monday to a big thump. That was me. I had fainted, face first onto the bathroom tile floor. When I came to, I saw a piece of tooth and blood on the floor next to me. Not good. After my husband helped me up apparently I passed out again and he called the ambulance. I was not keen on being paraded around town in my pj's with straight-out-of-bed hair. I begged my husband to let me take a shower and do my hair, but he wouldn't let me. Silly me, even sick I want to look good. But I supposed with a split lip and a broken tooth, I wasn't really going to improve my looks any. I did indeed go to the hospital because I knew I was going to need stitches and they had drugs to make me stop feeling sick. I spent the week home last week, recovering from the virus and my injuries. Needless to say I really didn't feel like baking anything. 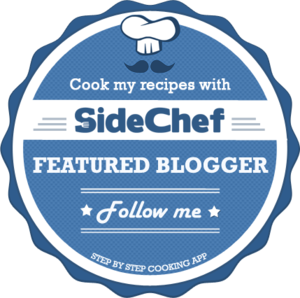 But now that I am better I can share a new recipe with you. 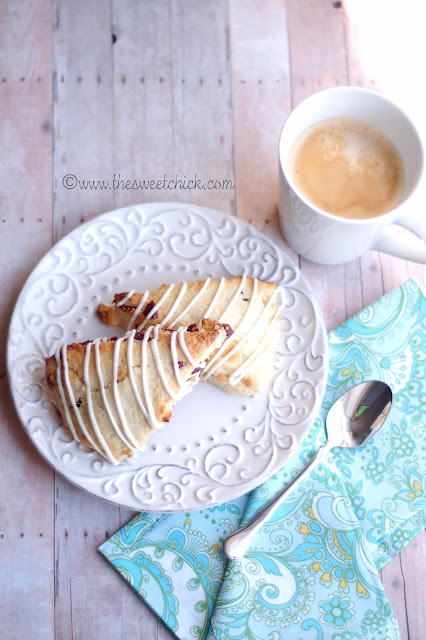 For those of you who like scones (me! me! ), here is a new flavor. 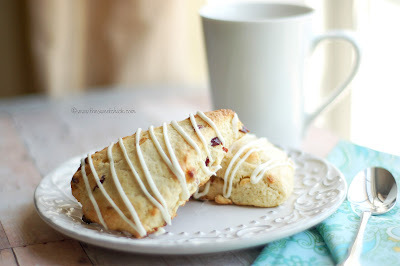 Lemon Cranberry Scones with white chocolate chips inside and drizzled with white chocolate on the outside. Sounds yummy right? Well they are. Scones are so easy to make and there are so many possible flavors. I can't get enough of them. This time I found a better way to get triangles. I rolled the dough into a ball, then flattened it out on a lightly floured surface. Using a pizza cutter I divided the circle into eight triangles. I then separated the triangles and placed them on my cookie sheet to bake. They came out much better this way. I should have probably made the triangles a little smaller, because the scones did come out pretty big. But no one complained. They ate the whole thing. Mix flour, sugar, and baking powder. Cut up butter and add to flour mixture. In a separate bowl mix egg and milk until blended and add to the flour mixture. Add lemon rind and lemon juice. Next mix in the cranberries and white chocolate chips. The batter will be a dough like consistency. Take the dough and roll it into one big ball. Place the ball onto a lightly floured surface and flatten out to about an inch thick. With a knife or pizza cutter, divide the dough circle into equal triangles. I made eight big scones, but you can make yours a little smaller if you like. Separate the triangles and place on a cookie sheet. Bake at 425 degrees for 15 minutes or until tops are golden. When scones have cooled off, melt the white chocolate/candy melt according to package and drizzle over the tops. Let the chocolate set and then it's time to eat and enjoy!